شکریه, محمود مهرداد, شاعلی, محمدحسن. (1394). روش نانونفوذگری شبیه‌سازی شده برای تعیین مایکرو تنش‌پسماند یک لایه تک‌جهته کامپوزیتی. علوم و فناوری کامپوزیت, 2(4), 1-12. محمود مهرداد شکریه; محمدحسن شاعلی. "روش نانونفوذگری شبیه‌سازی شده برای تعیین مایکرو تنش‌پسماند یک لایه تک‌جهته کامپوزیتی". 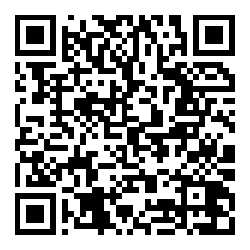 علوم و فناوری کامپوزیت, 2, 4, 1394, 1-12. شکریه, محمود مهرداد, شاعلی, محمدحسن. (1394). 'روش نانونفوذگری شبیه‌سازی شده برای تعیین مایکرو تنش‌پسماند یک لایه تک‌جهته کامپوزیتی', علوم و فناوری کامپوزیت, 2(4), pp. 1-12. شکریه, محمود مهرداد, شاعلی, محمدحسن. روش نانونفوذگری شبیه‌سازی شده برای تعیین مایکرو تنش‌پسماند یک لایه تک‌جهته کامپوزیتی. علوم و فناوری کامپوزیت, 1394; 2(4): 1-12. آزمون نفوذگری روشی است که از طریق بررسی رفتار ماده در پاسخ به عمل نفوذگری روی جسم به اطلاعاتی در مورد آن دست می‌یابد. از مهم‌ترین اطلاعاتی که می‌توان از این پاسخ گرفت، مدول الاستیسیته و همچنین تنش‌پسماند نهفته در جسم است. کامپوزیت‏ها ترکیبی از دو یا چند ماده متفاوت هستند و تنش‌های پسماند نیز به دلیل همین اختلاف و ناهمگونی ایجاد می‏شود. با توجه به اثرات مخربی که این نوع تنش‌ها بر عملکرد سازه‏های کامپوزیتی دارند، تعیین مقدار و توزیع آن‌ها ضروری است. در کامپوزیت‌های لایه‌ای، برای تعیین تنش‌های‌پسماند در مقیاس مکرومکانیک روش‌های تجربی و مکانیکی وجود دارد، اما برای تعیین تنش‌های‌پسماند در مقیاس مایکرومکانیک روشی تجربی و مکانیکی که بتواند این تنش‌ها را اندازه‌گیری کند، وجود ندارد. هدف از پژوهش حاضر، شبیه‌سازی المان محدود آزمون نفوذگری برای تعیین مدول الاستیسیته و همچنین مایکرو تنش‌پسماند در یک لایه تک‌جهته کامپوزیتی است. برای این منظور، المان حجمی معرف مناسبی از کامپوزیت در نظرگرفته شده و نفوذگر مجازی روی آن انجام شده‏است. نتایج نشان می‏دهد که مدول الاستیسیته تخمین زده شده برای الیاف، به این روش، به عمق نفوذ نفوذگر وابسته است، اما تنش‌پسماند محاسبه شده، مستقل از عمق نفوذ نفوذگر است. برای بررسی تاثیر ماتریس روی نتایج نفوذگری در الیاف، علاوه بر مدل‌سازی کامپوزیت، یک ماده همسانگرد که خواصی مشابه با الیاف شیشه دارد نیز مدل‌سازی شده است و نتایج آن با نتایج کامپوزیت مقایسه شده‏است. Indentation test is a method in which the behavior of a material, in response to the indentation can provide a variety of information. Residual stresses within the body and modulus of elasticity are of the most important information that can be obtained from this response. A composite material is a combination of two or more different materials and due to this difference and heterogeneity a residual stress occurs in them. Considering the destructive effects of this kind of stresses on performance of composite structures, it is necessary to determine the magnitudes and distribution of them. Currently there are some mechanical experimental methods for determining macro residual stresses in laminated composites. However, there is no mechanical experimental method for determination of micro residual stresses in a unidirectional ply. In this research, a finite element simulation of the indentation test for determining the modulus of elasticity and micro-residual stresses of a unidirectional composite ply is presented. For this purpose, an appropriate representative volume element of the unidirectional composite ply has been considered and a virtual indentation has been applied on it. The results show that the estimated modulus of elasticity for the fiber in this way depends on the penetration depth, while the estimated residual stresses are independent of the penetration depth. To evaluate the effect of matrix on the results of the indentation in fibers, an isotropic material with similar properties to the glass fiber, has been modeled and the results were compared with the results of indentation on composites. 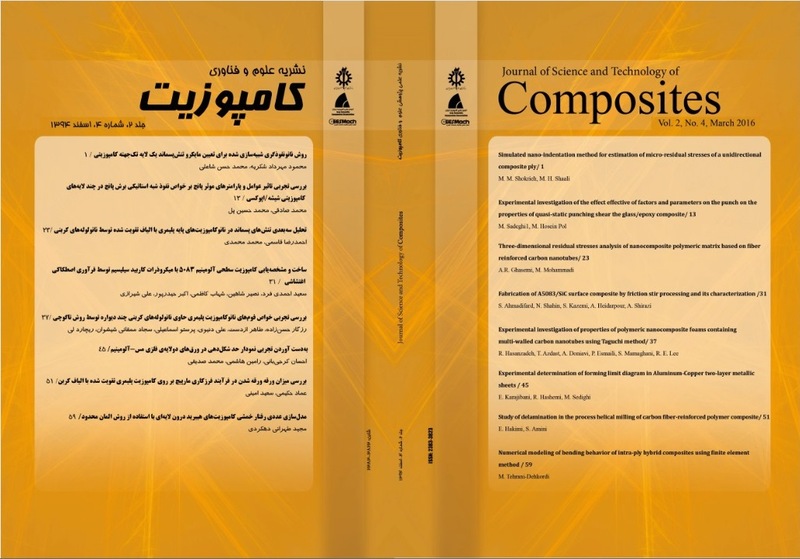 Ghasemi, A. R., "Determination of residual sresses in laminated composites," In Persian, Ph.D Thesis, Iran University of Science and Technology, Iran, 2011, 2007. Safarabadi, M., "Analytical Solution for Determination of Curing Residual Stresses in Composite Lamintes," In Persian, Ph.D Thesis, Iran University of Science and Technology, Iran, 2011. Stango, R. J. and Wang, S. S., "Process-induced residual thermal stresses in advanced fiber-reinforced composite laminates," Journal of Manufacturing Science and Engineering, vol. 106, pp. 48-54, 1984. Jang, J.-I., "Estimation of residual stress by instrumented indentation: A review," Journal of Ceramic Processing Research, vol. 10, pp. 391-400, 2009. Fischer-Cripps, A. C., Nanoindentation: Springer Science & Business Media, 2011. Oliver, W. C. and Pharr, G. M., "Measurement of hardness and elastic modulus by instrumented indentation: Advances in understanding and refinements to methodology," Journal of Materials Research, vol. 19, pp. 3-20, 2004. Suresh, S. and Giannakopoulos, a. E., "A new method for estimating residual stresses by instrumented sharp indentation," Acta Materialia, vol. 46, pp. 5755-5767, 1998. Lee, Y.-H. and Kwon, D., "Measurement of residual-stress effect by nanoindentation on elastically strained (1 0 0) W," Scripta Materialia, vol. 49, pp. 459-465, 2003. Lee, Y.-H. and Kwon, D., "Estimation of biaxial surface stress by instrumented indentation with sharp indenters," Acta Materialia, vol. 52, pp. 1555-1563, 2004. Taljat, B. and Pharr, G. M., "Measurement of residual stresses by load and depth sensing spherical indentation," Materials Research Society Symposium - Proceedings, vol. 594, pp. 519-524, 2000. Swadener, J. G., Taljat, B., and Pharr, G. M., "Measurement of residual stress by load and depth sensing indentation with spherical indenters," Journal of Materials Research, vol. 16, pp. 2091-2102, 2001. Chen, X., Yan, J., and Karlsson, A. M., "On the determination of residual stress and mechanical properties by indentation," Materials Science and Engineering A, vol. 416, pp. 139-149, 2006. Xu, Z.-H. and Li, X., "Influence of equi-biaxial residual stress on unloading behaviour of nanoindentation," Acta Materialia, vol. 53, pp. 1913-1919, 2005. Jin, K. K., Oh, J. H., and Ha, S. K., "Effect of Fiber Arrangement on Residual Thermal Stress Distributions in a Unidirectional Composite," Journal of Composite Materials, vol. 41, pp. 591-611, 2006. Chawla, K. K., "Composite Materials: Science and Engineering, 1998," ed: Springer, New York. Wallenberger, F. T. and Bingham, P. A., "Fiberglass and Glass Technology," 2010. Lichinchi, M., Lenardi, C., Haupt, J., and Vitali, R., "Simulation of Berkovich nanoindentation experiments on thin films," vol. 333, pp. 278-286, 1998. Khan, M. K., Fitzpatrick, M. E., Hainsworth, S. V., and Edwards, L., "Effect of residual stress on the nanoindentation response of aerospace aluminium alloys," Computational Materials Science, vol. 50, pp. 2967-2976, 2011. Huber, N. and Heerens, J., "On the effect of a general residual stress state on indentation and hardness testing," Acta Materialia, vol. 56, pp. 6205-6213, 2008.